Los Angeles Mayor Eric Garcetti, center, wasted little time making his pitch. 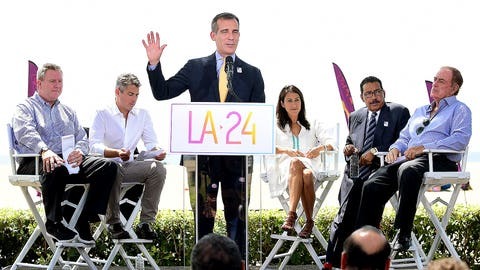 LONDON — Los Angeles Mayor Eric Garcetti and U.S. Olympic officials have wasted no time in taking their bid for the 2024 Games to IOC headquarters. Garcetti, bid chairman Casey Wasserman and U.S. Olympic leaders met with IOC President Thomas Bach on Thursday in Lausanne, Switzerland, to discuss their plans for bringing the Summer Games back to the United States for the first time in 28 years. The meeting came just two days after the USOC named Los Angeles at its bid city. Los Angeles replaced Boston, whose bid was dropped in late July amid a lack of public and political support.